Security Council President, Foreign Minister Kim Sung-hwan of the Republic of Korea, reads statement to the press. 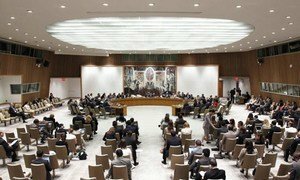 The Security Council and top United Nations officials have strongly condemned the nuclear test carried out by the Democratic People’s Republic of Korea (DPRK), warning that it constitutes a threat to international peace and security. Following an emergency closed-door session, the Council said the test is a “grave violation” of relevant resolutions adopted by the 15-member body. “In line with this commitment and the gravity of this violation, the members of the Security Council will begin work immediately on appropriate measures in a Security Council resolution,” Kim Sung-hwan, Foreign Minister of the Republic of Korea, which holds the rotating presidency of the Council for February, said in a statement read out to the press. Secretary-General Ban Ki-moon, in a statement issued by his spokesperson overnight, called Pyongyang’s action “deplorable,” and voiced concern at its impact on regional stability. “It is deplorable that Pyongyang has chosen the path of defiance,” he added, urging the Council to act and speak in a unified matter. According to media reports citing the Korean Central News Agency (KCNA), the Government of DPRK conducted its third, long-threatened nuclear test earlier today. A test would be a violation of sanctions imposed on DPRK by the Council following nuclear tests in 2006 and 2009, including a ban on the import of nuclear and missile technology. The sanctions were further tightened last month in a unanimous decision by the Council after DPRK reportedly launched a long-range Unha-3 rocket from its west coast in December 2012. In a statement, the Agency’s Director General, Yukiya Amano, urged DPRK to implement all relevant resolutions from the Security Council and the IAEA Board of Governors, and reiterated the need to resume IAEA nuclear verification activities in the country as soon as a political agreement is reached. Reiterating its condemnation of a December 2012 missile launch by the Democratic People’s Republic of Korea (DPRK), the United Nations Security Council today more sharply targeted sanctions on that country, while again demanding an end to its nuclear and ballistic tests.